King Haakon VII Sea (Norwegian: Kong Haakon VII Hav) is a proposed name for part of the Southern Ocean on the coast of East Antarctica. Overview of the proposed King Haakon VII Sea at top of the map. Area map of King Haakon VII Sea proposal. Overview map: Crown Princess Märtha Kyst, Princess Astrid Kyst and Princess Ragnhild Kyst. The International Hydrographic Organization (IHO), often recognized as the authority for worldwide water body names, does not include this sea name. The IHO 2002 draft was never approved by the IHO (or any other organization), and the 1953 IHO document (which does not contain the name) remains currently in force. Most leading geographic authorities and atlases do not use the name, including the 2014 10th edition World Atlas from the National Geographic Society. By a narrow proposed definition, this sea would be between the Weddell Sea and a proposed Lazarev Sea name, and thus stretch only along Princess Martha Coast from Cape Norvegia at 12°18′W, the easternmost point of the Weddell Sea, to Fimbul Ice Shelf close to the Prime Meridian at 0°0′, which is proposed as the western border of Lazarev Sea. From the Norwegian point of view, which also does not recognize Lazarev Sea, King Haakon VII Sea is situated along the entire coast of Queen Maud Land between 20°W and 45°E and stretches for about 10,090 km (6,270 mi) from the Stancomb-Wills Glacier at 19°W on Princess Martha Coast in the west to Shinnan Glacier at 44°38′E on the eastern border of Prince Olav Coast in the east. The water here is covered by ice most of the year. During autumn pack ice forms which does not break up until spring. The rough coordinates of the proposed sea area would be 67°S 20°E﻿ / ﻿67°S 20°E. The area is an important habitat for the Ross seal (Ommatophoca rossii). On 27 January 1820 Russian Fabian Gottlieb von Bellingshausen made the first confirmed sighting of Terra Australis (Antarctica) as he was cruising this area near the Fimbul Ice Shelf at Princess Märtha Coast. The area is named in honour of Haakon VII, the first king of Norway after the dissolution from Sweden. ^ "Limits of Oceans and Seas, 3rd (currently in-force) edition" (PDF). International Hydrographic Organization. 1953. Retrieved 5 June 2015. The Balearic Sea (endotoponym: Mar Balear in Catalan and Spanish) is a body of water in the Mediterranean Sea near the Balearic Islands. It is not to be confused with the Alboran Sea or the Iberian shelf waters. The Ebro River flows into this small sea. Cape Norvegia is a prominent cape on Princess Martha Coast of Queen Maud Land. It marks the northeast extremity of Riiser-Larsen Ice Shelf in East Antarctica, and the border point of Weddell Sea and King Haakon VII Sea. It was discovered by Commander Hjalmar Riiser-Larsen in February 1930 while on an airplane flight from the Norvegia, the ship in which the expedition was made. The cape was named by Riiser-Larsen for the ship. 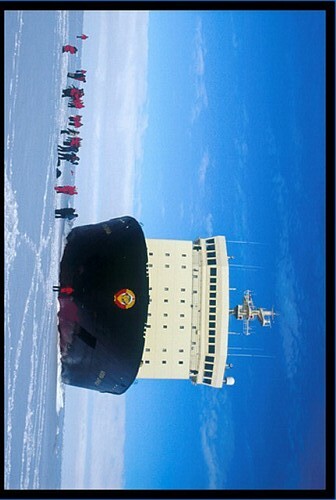 D'Urville Sea is a sea of the Southern Ocean, north of the coast of Adélie Land, East Antarctica. It is named after the French explorer and officer Jules Dumont d'Urville. The Irminger Sea is a marginal sea of the North Atlantic Ocean. It was named after Danish vice-admiral Carl Ludvig Christian Irminger (1802–1888), after whom also the Irminger Current was named. Jutulsessen is a nunatak in the Gjelsvik Mountains in Queen Maud Land, Antarctica. It is located in Princess Martha Coast, 235 kilometers (146 mi) from the King Haakon VII Sea. Jutulsessen is the site of the Norwegian research station Troll and the affiliated Troll Satellite Station, which has two radomes on top of the mountain. Troll Airfield is located in the vicinity. The Kara Strait or Kara Gates (Russian: Карские Ворота, translit. Karskiye Vorota) is a 56 km (35 mi) wide channel of water between the southern end of Novaya Zemlya and the northern tip of Vaygach Island. This strait connects the Kara Sea and the Barents Sea in northern Russia. The Kara Strait was an important waterway in the early exploration of the Northern Sea Route. The Koro Sea or Sea of Koro is a sea in the Pacific Ocean between Viti Levu island, Fiji to the west and the Lau Islands to the east, surrounded by the islands of the Fijian archipelago. It is named after Koro Island. The Lazarev Sea (Russian: Море Лазарева, More Lazareva) is a proposed name for a marginal sea of the Southern Ocean. It would be bordered by two proposals from a 2002 International Hydrographic Organization (IHO) draft, a King Haakon VII Sea to the west and a Riiser-Larsen Sea to the east, or between the Prime Meridian of 0° and 14°E. It would stretch over an area of 929,000 km2 (359,000 sq mi).The Lazarev Sea was named in 1962 by the Soviet Antarctic Expedition in honor of Russian admiral Mikhail Lazarev (1788–1851), who discovered the Antarctic mainland with Fabian Gottlieb von Bellingshausen in 1820. The 2002 IHO draft was never approved by the IHO (or any other organization), and the 1953 IHO document (which does not contain this name) remains currently in force. Leading geographic authorities and atlases do not use the name, including the 2014 10th edition World Atlas from the United States' National Geographic Society and the 2014 12th edition of the British Times Atlas of the World. But Soviet and Russian-state maps do.The prevailing depth of waters here is 3,000 m (9,800 ft), and the maximum depth exceeds 4,500 m (14,800 ft). It stretches over an area of 929,000 km2 (359,000 sq mi).To the south of Lazarev Sea lies Princess Astrid Coast of Queen Maud Land. This is a list of seas – large divisions of the World Ocean, including areas of water variously, gulfs, bights, bays, and straits. Prince Gustav Adolf Sea is a marginal sea of the Arctic Ocean located in Qikiqtaaluk Region, Nunavut, Canada. Princess Astrid Coast is that portion of the coast of Queen Maud Land, Antarctica, lying between 5° and 20° E. The entire coast is bordered by ice shelves. Discovered by Capt. H. Halvorsen of the Sevilla (ship) in March 1931 and in 1932 named for Princess Astrid of Norway. Off Princess Astrid Coast are Lazarev Sea and Riiser-Larsen Sea, both marginal seas of the Southern Ocean. According to the Norwegian point of view, King Haakon VII Sea stretches in that place and along the entire coast of Queen Maud Land. This article incorporates public domain material from the United States Geological Survey document "Princess Astrid Coast" (content from the Geographic Names Information System). Queen Maud Land (Norwegian: Dronning Maud Land) is a c. 2.7 million square kilometre (1.04 million sq mi) region of Antarctica claimed as a dependent territory by Norway. The territory lies between 20° west and 45° east, between the claimed British Antarctic Territory to the west and the similarly claimed Australian Antarctic Territory to the east. On most maps there had been an unclaimed area between Queen Maud Land's borders of 1939 and the South Pole until 12 June 2015 when Norway formally annexed that area. Positioned in East Antarctica, the territory comprises about one-fifth of the total area of Antarctica. The claim is named after the Norwegian queen Maud of Wales (1869–1938). Norwegian Hjalmar Riiser-Larsen was the first person known to have set foot in the territory, in 1930. On 14 January 1939, the territory was claimed by Norway. From 1939 until 1945, Nazi Germany claimed New Swabia, which consisted of part of Queen Maud Land. On 23 June 1961, Queen Maud Land became part of the Antarctic Treaty System, making it a demilitarised zone. It is one of two Antarctic claims made by Norway, the other being Peter I Island. They are administrated by the Polar Affairs Department of the Norwegian Ministry of Justice and Public Security in Oslo. Most of the territory is covered by the Antarctic ice sheet, and a tall ice wall stretches throughout its coast. In some areas further within the ice sheet, mountain ranges breach through the ice, allowing for birds to breed and the growth of a limited flora. The region is divided into the Princess Martha Coast, Princess Astrid Coast, Princess Ragnhild Coast, Prince Harald Coast and Prince Olav Coast. The waters off the coast are called the King Haakon VII Sea. There is no permanent population, although there are 12 active research stations housing a maximum average of 40 scientists, the numbers fluctuating depending on the season. Six are occupied year-round, while the remainder are seasonal summer stations. The main aerodromes for intercontinental flights, corresponding with Cape Town, South Africa, are Troll Airfield, near the Norwegian Troll research station, and a runway at the Russian Novolazarevskaya Station. The Queen Victoria Sea (Russian: Море королевы Виктории, Morye Korolevy Viktorii) is a body of water in the Arctic Ocean, stretching from northeast of Svalbard to northwest Franz Josef Land. It is obstructed by ice most of the year. This sea is named after Queen Victoria. Russian Arctic explorer Valentin Akkuratov claimed that a branch of the Gulf Stream reached as far north as the Queen Victoria Sea. The Sea of the Hebrides () is a portion of the North Atlantic Ocean, located off the coast of western Scotland, separating the mainland and the northern Inner Hebrides islands (to the east) from the southern Outer Hebrides islands (to the west). To the north, the Sea of the Hebrides joins The Minch.The Sea of the Hebrides forms part of the Inner Seas off the West Coast of Scotland, as defined by the International Hydrographic Organization, and part of the Seas west of Scotland as far as fisheries management is concerned. The Sibuyan Sea is a small sea in the Philippines that separates the Visayas from the northern Philippine island of Luzon. It is bounded by the island of Panay to the south, Mindoro to the west, Masbate to the east, and to the north Marinduque and the Bicol Peninsula of Luzon Island. The Sibuyan Sea is connected to the Sulu Sea via the Tablas Strait in the west, the South China Sea via the Isla Verde Passage in the northwest, and the Visayan Sea via the Jintotolo Channel in the south-east. The Romblon Islands lie within the Sibuyan Sea. The Visayan Sea is a sea in the Philippines surrounded by the islands of the Visayas: Western Visayas, Eastern Visayas, and Central Visayas to the south. It is bounded by the islands Masbate to the north, Panay to the west, Leyte to the east, and Cebu & Negros to the south. The sea is connected to the Sibuyan Sea to the northwest via the Jintotolo Channel, the Samar Sea to the northeast, the Panay Gulf (part of the Sulu Sea) to the southwest via the Guimaras Strait, and the Camotes Sea to the southeast. The largest island within this sea is Bantayan Island of Cebu province. The Wandel Sea (Danish: Wandelhavet also known as McKinley Sea) is a body of water in the Arctic Ocean, stretching from northeast of Greenland to Svalbard. It is obstructed by ice most of the year. This sea is named after Danish polar explorer and hydrographer, Vice Admiral Carl Frederick Wandel, who in years 1895–96 explored the coastal waters of Greenland as part of the Danish Ingolf Expedition. The Weddell Sea is part of the Southern Ocean and contains the Weddell Gyre. Its land boundaries are defined by the bay formed from the coasts of Coats Land and the Antarctic Peninsula. The easternmost point is Cape Norvegia at Princess Martha Coast, Queen Maud Land. To the east of Cape Norvegia is the King Haakon VII Sea. Much of the southern part of the sea is covered by a permanent, massive ice shelf field, the Filchner-Ronne Ice Shelf. The sea is contained within the two overlapping Antarctic territorial claims of Argentine Antarctica, the British Antarctic Territory, and also resides partially within the Antarctic Chilean Territory. At its widest the sea is around 2,000 kilometres (1,200 mi) across, and its area is around 2.8 million square kilometres (1.1×10^6 sq mi).Various ice shelves, including the Filchner-Ronne Ice Shelf, fringe the Weddell sea. Some of the ice shelves on the east side of the Antarctic Peninsula, which formerly covered roughly 10,000 square kilometres (3,900 sq mi) of the Weddell Sea, had completely disappeared by 2002. Whilst a dramatic event, the area that disappeared was far smaller than the total area of ice shelf that remains. The Weddell Sea has been deemed by scientists to have the clearest water of any sea. Researchers from the Alfred Wegener Institute, on finding a Secchi disc visible at a depth of 80 metres (260 ft) on 13 October 1986, ascertained that the clarity corresponded to that of distilled water. In his 1950 book The White Continent, historian Thomas R. Henry writes: "The Weddell Sea is, according to the testimony of all who have sailed through its berg-filled waters, the most treacherous and dismal region on earth. The Ross Sea is relatively peaceful, predictable, and safe." He continues for an entire chapter, relating myths of the green-haired merman sighted in the sea's icy waters, the inability of crews to navigate a path to the coast until 1949, and treacherous "flash freezes" that left ships, such as Ernest Shackleton's Endurance, at the mercy of the ice floes.